How often do you search for a word when having a conversation? Build a better weather vocabulary base by engaging problem solving skills to decipher this weather cryptolist puzzle. Puzzle suitable for students in grade 9 to 12 classrooms, home schoolers and as a tutoring resource. 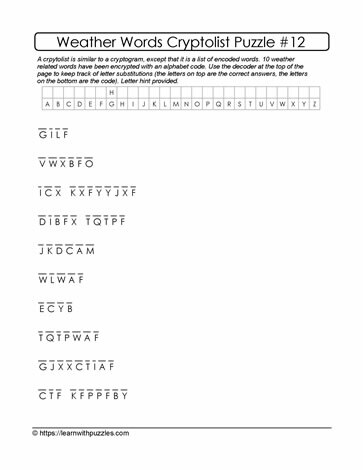 Knowledge of weather related words, combined with letter patterns and word structures will help with the decryption the letters encoded in the puzzle.